Premium electric lower height toilet with seperated flushing and waste disposal cycle. Including electronic 3 function control panel, before use, after use and short use plus a trimmer to regulate the flow rate. Water is from existing pressurized water system onboard with 24V solenoid valve (PN 07-66-031) or 24V flush pump (PN 07-66-033)- not included! Very silent operation and maximized comfort. 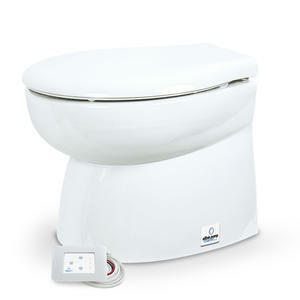 Easy to clean white premium ceramic bowl and white rigid thermoset material softclose seat with stainless steel hinges. Port conections inlet 19mm (3/4"), outlet 25mm or 32mm (1" or 1,5"). Robust, stable with a preferred premium appearance like a home toilet. Interchangeable with premium/ luxury models from Jabsco, Dometic, Tecma.